Wills never win the prize for "most popular legal documents." Since your Ohio last will and testament is not effective until you die, it's a topic that can be uncomfortable for many. The truth is, you should think of a will as your friend, a document that is going to be there and speak for you when you are gone. In every state, including Ohio, the assets of people who don't write wills pass to their nearest family members, but that's something you can arrange with a will, too. However, with a will, you can also leave your investment accounts to others. If you want to, you can specify in a will that all your assets go to the SPCA, the NRA, or to the neighbor who mowed your lawn while you were on vacation and refused to accept payment for it. Ohio makes it easy to get that will in place. In Ohio, you can write out a will by hand, type it or print it. As long as you get two adults to witness it, you are good to go in Ohio. If someone dies without a will in Ohio, he is said to die intestate. That means that the intestate laws of the state determine who gets the person's property. The person himself has no say. Every state has an intestate inheritance law setting out which relatives are in line to inherit the property of someone who dies without a will. Usually, a surviving spouse and kids are first in line. If the deceased does not have a spouse or kids, the person's grandchildren often inherit. The deceased's parents and siblings are usually next on the list. Ohio's intestate rules are found in Ohio Revised Code 2105. It provides that, if there is no will, the decedent's property shall go to a surviving spouse and/or surviving children, if any. Next in line are the deceased's parents and then the deceased's siblings. If there are none, the property goes to surviving grandparents. If this matches up exactly with the way you wish your property to be divided when you die, you are a rare individual. Usually people don't love their families in the order of blood lines, and often there is a friend, neighbor or beloved charity that a person might like to leave something. If you have other ideas about where you would like your hard-earned money to go, it may be time to create that will in Ohio. If you live in Ohio, you have no excuse for failing to create a will if you decide to do it. The state makes it easy. Ohio law (section 2107.02 and following provisions) only puts three limitations on who can make a will: you have to be at least 18 years old, competent and not "under restraint." That means that nobody is literally or figuratively holding a gun to your head to force you to make a will. The rules for creating a will in Ohio are not complex. All wills in Ohio must be in writing, other than a very narrow category of permissible oral wills. But the fact that they must be written doesn't mean they have to be complex or lawyer-created. A do-it-yourself will in Ohio is entirely possible. You can write out a will by hand, type it up on a typewriter or print it from a computer. You can get an Ohio sample will form and fill it in, or ask someone to write or type out your wishes. Essentially, all you have to put in a will is who you want to inherit your property when you die. You can leave everything to one person or organization, or you can detail every object and account you own and assign it to a different person in your will. You can do anything in between. Obviously, the more specific you are about listing and assigning assets, the longer the document will be, but that's your choice. Typically, you start a simple will by identifying yourself and noting that you are over the age of 18 and of sound mind. It then turns to a list of who you wish to inherit your assets. It's always a good idea to give as much information as you can about your beneficiaries, including date of birth and residence address, just to be sure there is no confusion. Remember to add the name of a trusted individual you would like to be your executor, the person who shepherds your estate through probate. Then you date the will and sign it. Ohio doesn't make you jump through the hoops some other states do when it comes to signing – also called executing – the will. In some states, your signature must be notarized and you must also have two witnesses signing as well, whose signatures must be notarized. Forget all that notary work in Ohio. The statute, 2107.03, is very clear about what is required. It says:. So all you need to do is sign the will in front of two (or more) competent witnesses who either watch you sign the will, or hear you say you signed it_,_ before signing it themselves. Neither your signature nor the signatures of the witnesses need be notarized. 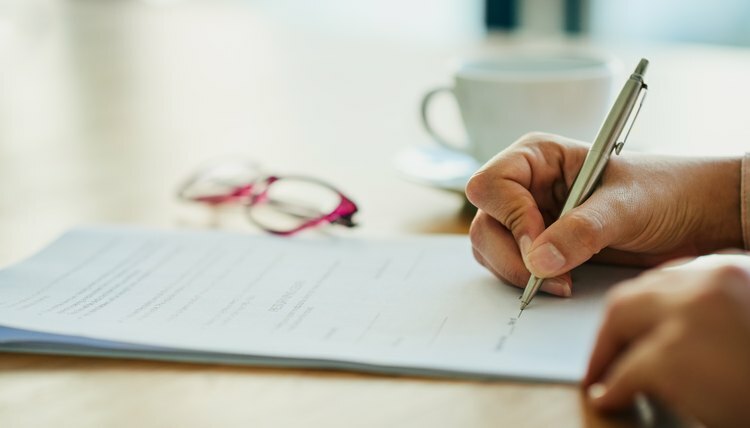 When the witnesses hear a person pronounce an oral will in Ohio, they must write down what the person said and sign the writing, just as with a written will. An oral will has to be put into probate within three months from the death of the person making it. A holographic will is a handwritten will. In states like California, a person can write out a valid holographic will by hand, if it is entirely in his handwriting and dated and signed by hand. This type of holographic will in California does not need to be witnessed, nor does the signature need to be notarized. The Ohio law is slightly different. While you can write out a will by hand in Ohio, you still need two will witnesses to sign it, too. Absent those witness signatures, the will is invalid. Do handwritten wills hold up in court? While holographic wills without witnesses, like those permitted in California, can be more difficult to prove in probate, handwritten wills in Ohio have two witnesses. Those people can testify that the will was made by the person signing it and that she was competent to make the will. That means that they hold up just fine in court. Even though making a will in Ohio is fairly easy and always a good idea, many people just don't do it. Some simply don't want to think about the time that they won't be alive any more. Others have some kind of misunderstanding about wills or what they accomplish. Putting these myths about wills to rest can make the idea of creating a will in Ohio more attractive. One myth some people believe is that probate will cost more if you make a will. The Ohio State Bar Association says that is not the case, noting that it does not cost more to administer a will, and it actually takes more effort to administer an estate without a will. That's because, with a will, the executor knows how to distribute probate property, since it is clearly stated in the will. In an estate without a will, the probate court distributes assets to the closest living relatives. Both processes require some administration. Another myth is that you don't need a will unless you have a relatively large estate. In fact, even if you just have one piece of real property or one bank account, a will gets your assets into the hands of the person you want. A similar misunderstanding is the belief that a will is quite expensive to prepare. As described above, it is entirely possible to write up your own will by hand and get two adult friends to witness it. Of course, if you own a lot of complex investments, you will probably need an attorney to help and advise you, but the more property you own, the more important it is that you specify your beneficiaries yourself and do not leave it to state law. You cannot leave every single type of property in a will. Some are specifically designed to pass to another person outside of a will or probate. For example, if you buy life insurance, it will pass to the person you list as your beneficiary directly, and that cannot be changed in the will. For example, if you buy life insurance and list your niece as beneficiary, the insurance proceeds will pass directly to your niece even if you leave it to your nephew in your will. Another type of property you cannot bequeath in your will is property you own with someone else with rights of survivorship. Under this type of ownership, the interest of an owner who dies passes automatically to the co-owners who survive. For example, let's say you own property with your spouse and two children in joint tenancy with right of survivorship. When you die, your 25 percent share gets divided up between the surviving owners automatically. If you happen to leave that property to someone else in your will in Ohio, the bequest will be invalid. Spengler, Teo. "How to Create a Will in Ohio." , https://legalbeagle.com/6231960-create-ohio.html. 26 July 2018.